Hat heute Geburtstag!! Grande BATIGOL!! Zusammen mit Stoitchkov und Romario, einer der besten Stürmer die ich noch aktiv miterleben durfte. Mein Gott, war der komplett! Technik, Schusstechnik, Kopfballspiel, Freistösse, er hatte einfach alles, ein Fussballgott wie im Bilderbuch. Solche Fussballer müssen heutzutage erst noch geboren werden! Wenn du Stoitchkov erlebt hast, wie fandest du dann den Roberto Baggio? ja, war schon ein feiner der alte. Um ehrlich zu sein, hatte ich nie wirklich die Möglichkeit und das grosse Interesse seine Leistungen zu verfolgen, aber das wenige was ich von ihm gesehen habe war natürlich schon beeindruckend. Bati gab dem Magazin "France Football" ein Interview und sprach über seine Karriere, seinen aktuellen Gesundheitszustand, Leo Messi sowie seine neue Rolle als Sportdirektor von Club Atlético Colón. Florent TORCHUT (journaliste): You have practically dissapeared from the spotlight since 2005 and your retirement from Al-Arabi. What have you done since then? FT: You didn't intend to talk about football? Gabriel BATISTUTA: I was really tired, stressed. I was rather stressed compared to what I had achieved during my carreer. I had to live up to the occasion. At 33 years of age that was becoming more difficult. I was always a professional, I wanted to keep the rhythm and I couldn't really reach that anymore, so I decided to quit. Gabriel BATISTUTA: I've never thought of becoming a footballer. There have halways existed the myth that I didn't like football. But I've always liked playing, training, being on the pich. Besides it was always natural for me.On the contrary I've never liked all the debates around that. FT: Apparently you wanted to become a doctor. Gabriel BATISTUTA: From now on I watch them more. Before I played, it was my job. I was looking to stand aloof, once the day was over. That was my philosophy of life, the fact remains that I've always liked football. FT: Why did you come back to the spotlight? Gabriel BATISTUTA: It's been 7 years since I've retired. I used that time to relax but I was waiting for an opportunity (to return to the spotlight). Football is my thing. This is what I do. The president of Colón came to see me and I said yes to him because we share the same vision on football. FT: What was the thing about this project that win you over? Gabriel BATISTUTA: First of all its seriousness, secondly the fact that the club relies on the training of the players. I don't want just to participate, I want to win too. Colón makes progress but was never a club of the elite. It's time to take the plunge. That's the idea that got me excited. FT: What are your duties concerning the club? Gabriel BATISTUTA: I collaborate with the president on all the matters about football. I'm close to the first team and the youth academy, I give my opinion on what I think must be done to improve. I supervise the transfers too. FT: How do you explain that la selección despite the great names like MESSI doesn't manage to succed at the international scene? Gabriel BATISTUTA: MESSI is a phenomenon who's evolving in a team which has several phenomena. He is part of a group that is based on a genuine philosophy. A 13 year old kid at the Masia (Barcelona youth system) already thinks the same way that a player from the first team does. It's an example which we should follow. "We have to construct a playing style which will last. Every formation has it's own identity. We're not going to ask the Italians to play well, to shine: We know that they prefer to play defensive, to counter attack. Brazil has always had fullbacks which overlap and that center. They had to preserve their identity. It's what we should be looking to do with Argentina. FT: You have competed for 3 World Cups. For which do you have more regrets? Gabriel BATISTUTA: For all. The 3 times we went there to win. In 1994 we could have won it calmly with MARADONA. Without him that remained doable but against Romania (defeat of Argentina 3-2 at the round of 16), we must have had 30 shots on target, they got 3 and they scored 3 goals against us. In 1998 we had a young team. Against the Netherlands (defeat 2-1 in the quarter-finals),I shot on the goalpost and right after that shot, they scored with a counter-attack. If I had managed to score, we wouldn't have been there to talk about that... Lastly in 2002 everybody said that we would have won it but we couldn't manage to make it to the knockout stage! FT: You played at Fiorentina for 9 years before leaving for Roma to win the scudetto eventually in 2001. Do you regret not having left earlier? Gabriel BATISTUTA: No, I stayed because I wanted to stay. I wanted to win the championship with a little team, to make history. I'm proud that great clubs looked for me. Winning a championship with Manchester United was easy at that time. Winning a championship with a 15 point gap wouldn't really attract me at all. I wanted to score against the greatest defenders of Italy, the greatest of the world at that time. If I had gone, I would have scored more goals, I would have won La Liga or the Premier League. I've always had in mind that was I was fighting for, I would have won the Ballon D'or if I had played for Barça or Manchester but I wanted to win it with Fiorentina. FT: The "fox in the box" strikers of your time, don't exist anymore. Gabriel BATISTUTA: Nowadays the number 9s run everywhere, they don't stay exclusively at the target. We occupied the area, that was our job but the game has evolved, the centre-forwards participate in the team game. At my time they asked us above all to score goals. FT: Last year,there were rumours about your health. They said that you had walking problems. Gabriel BATISTUTA: I can't play football anymore because I can't run anymore but I walk quite well. I have to admit that there was a moment when I was feeling very badly. I almost couldn't walk. FT: Was that because of the multiple infiltrations during your carreer? 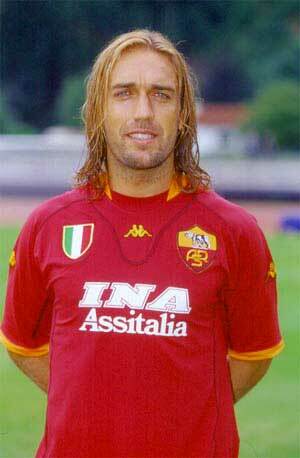 Gabriel BATISTUTA: Yes, I played all the time, in a season of 66 games, I played the 65. I've always surpassed myself. I couldn't accept that I shouldn't play because of an injury. If i had to do it all over again, I would have probably taken more care of myself but not too much. I liked to score, to please the public. Einer der grössten die je einen Ball gekickt haben wann klonen sie ihn endlich? Doppelt. Bevor ich loslege, ist das als Witz gemeint? Wo sind il Bomber und Osvoido? Aua der Jack wirkt noch immer. Achja so einen Frevel will ich hier nicht lesen auch wenn es nur als Witz gemeint ist. Dieser Thread, den ich eröffnet habe, ist eine Anbetungsstätte für Batigol und nichts anderes.